For LVM, encrypted, or limited-storage systems, you need to regularly remove old kernels to prevent your computer (/boot partition) from running out of storage space. It will ask you to type in user password and then remove old kernels as well as other automatically installed packages that are no longer needed. 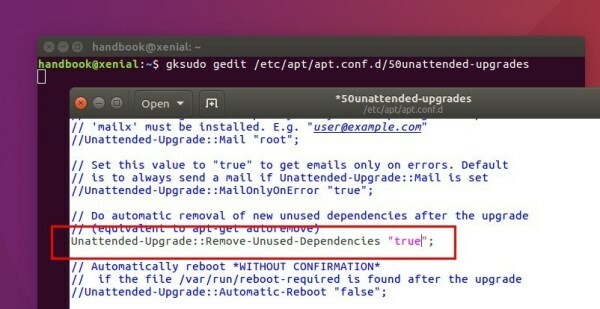 Enable Kernel autoremoving may cause problems if your package management is broken, see this bug. If you install latest kernels from Kernel PPA, or build your own kernels with patches, a “purge-old-kernels” script is the best and the easiest way to remove old kernels. rc: means it has already been removed. ii: means installed, eligible for removal. iU: DON’T REMOVE. It means not installed, but queued for install in apt. If the command fails, remove the dependency packages that the output tells you via sudo dpkg --purge PACKAGE. Thank you Ji m for your help,I am an old user of ubuntu in a sense of consumer cause I do not have any knowledge of programing or any kind of a sort. Just used this page for a corrupted update Ji, thanks man!! I suppose you got the information to your article from this Ubuntu Community Wiki article I wrote mainly. I have written a powerful script that makes purging even easier, and it handles even some trickier conditions. You can fund it here. The purge-old-kernels (basically just a list of old kernels with apt-get purge) is a handy script. Strange it is a part of byobu terminal program! Also, a word of caution on the last command – which removes all kernels except current booted one. This is not a good idea. You could’ve booted an earlier kernel to check something and if you build automation around this, you will blow away a newer kernel. Going by timestamps is not idea (as with purge-old-kernels) but unless you muck around /boot you should be fine. I had problem with installing a package using “apt-get” that required some dependencies however it throw errors regarding not enough space on /boot. I followed DPKG methods to free up some spaces on /boot and problem gone.